Aurora, Colo. Police Chief: Enough bullets went through to nearby building that at least one person was injured. Grief counseling and other resources for victims at Hinkley & Rangeview High School @9AM MDT. UPDATE: Media Briefing at 10:35 AM MDT at 17th and Peoria, No ? 's will be taken. UPDATE: Possibility of more controlled detonations. We will keep you updated. Peoria Street is OPEN. UPDATE: 2PM Press Conference is being pushed back to 2:10 PM MDT at the AMC. UPDATE: All hazards have been removed from the Paris Street location. Thanks everyone for all of the support during this tragic time. 100's of messages of support posted on our Facebook page. 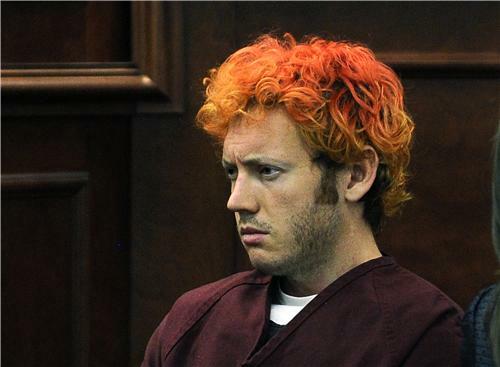 Colorado shooting suspect James Eagan Holmes makes his first court appearance in Aurora, Colorado, July 23, 2012. KUSA, which provided the pool video of today's court appearance by James Holmes, cites a technical difficulty with its mobile broadcasting gear for the occasional interruption of its feed. The mobile broadcasting gear uses broadband data commonly found in cell phones and smartphones. "The sheer volume of data usage in the area sapped the bandwidth that was going to the source of the information: the one feed being relied upon by the world to observe the court hearing," Brandon Rittiman wrote on a station blog. "The mass texting, tweeting, and posting of information in real-time crushed the cell signal providing the information in the first place." Rittiman added that the station is "working on lessons learned and looking for solutions for next time." The man accused of shooting dead 12 people in a Colorado movie theater made his first appearance in court on Monday, sitting silently in a red jailhouse jump suit and with his hair dyed bright red. Rough Cut (no reporter narration). The University of Colorado at Denver is expected to hold a news briefing on James Holmes' involvement in their Ph.D. program. That briefing is expected to start at or around 3:30 PM ET. The attorney representing the family of James Holmes is expected to hold a news briefing at 4:00 PM ET. It's not known what the attorney will be discussing. We would like to remind the media that we are under a COURT ORDER to not discuss the case.Obviously we take this matter very serious. In an interview set to air on the NBC Nightly News Wednesday evening, presidential hopeful Mitt Romney challenged the legality of some of the weapons possessed by Aurora, Colorado shooting suspect James Holmes. "This person shouldn't have had any kind of weapons and bombs and other devices and it was illegal for him to have many of those things already," Romney says in the NBC News interview. "But he had them. " With regards to the firearms and ammunition, Aurora Police Chief Dan Oates said at a press conference the day of the shooting that his understanding was all weapons and ammunition were purchased and possessed legally. "My understanding is all weapons he possessed, he possessed legally. All ammunition he possessed, he possessed legally," Oates said. It's unclear how Holmes obtained the material used to booby-trap his apartment. Reports have surfaced that a notebook crafted by the accused Colorado mass shooting suspect James Holmes was mailed ot a psychiatrist several days before the shooting that killed 12 people at an Aurora movie theater. FOXNews.com was the first to report the notebook, which was discovered monday according to the website. The report said police and FBI agents were called to the University of Colorado's Anchutz Medical Campus on Monday after a psychiatrist received a package thought to be from the suspect. The first funeral for one of the victims of Friday's mass shooting at a Colorado movie theater, a 51-year-old father of four, will be held on Wednesday. Gordon Cowden, the oldest person killed, was a self-employed real estate appraiser who had taken his teenage daughters to the midnight showing of "The Dark Knight Rises" when he was killed along with 11 others in a hail of bullets allegedly fired by 24-year-old James Eagan Holmes. His daughters escaped unharmed. Cowden's funeral, the first to occur since the July 20 massacre, will take place Wednesday morning at Pathways Church in Denver. One of the individuals injured in the mass shooting at an Aurora, Colorado movie theater last week is facing a large medical bill for services rendered. The friends of aspiring comedian Caleb Medley say they will try to help collect the $2 million needed to cover the man's expenses after he was shot during a screening of "The Dark Knight Rises" last Friday, Denver CBS affiliate KCNC reports. Medley's wife Katie gave birth recently in the same hospital where her husband is being treated. President Barack Obama pledged on Wednesday to work with leaders of all political stripes to "arrive at a consensus" on how to reduce gun violence across the United States after the Colorado shootings highlighted the issue in an election year. Authorities have prevented what they believe was an attempt to copy the Aurora, Colorado mass shooting by a suspect in Maryland, a Washington, D.C.-area television station reported Friday. According to WJLA-TV, law enforcement arrested an unidentified indivudual Thursday night. Officials told the TV station that the man had made threats against his employer after facing termination from his job. Pallbearers carry the casket of massacre victim Micayla Medek after her funeral in Aurora July 26, 2012. Family and friends filed into a Denver church on Thursday for the funeral of the 23-year-old woman who was among the 12 people killed in a massacre at the opening of the new "Batman" movie, as investigators sought to piece together a possible motive for the shooting rampage. Aurora, Colorado mass shooting suspect James Holmes is making a court appearance today at 9:30 AM local time (11:30 AM ET). Per a judge's order, cameras will not be allowed in the courtroom on Monday. James Holmes won't face an additional homicide charge in connection with the death of a fetus, the Denver Post reports citing a former prosecutor. Colorado laws only apply to individuals "who had been born and alive," the prosecutor told the newspaper. Ashley Moser suffered a miscarriage while recovering from injuries sustained in the July 20th shooting. Her daughter, six-year-old Veronica Moser, died in the attack. CALL7 is learning the learning hearing for #shootingsuspect is ending. James Holmes facing142 criminal counts. Reuters is now also reporting that the prosecutor has charged James Holmes with 12 counts of first-degree murder in the Colorado movie theater massacre.